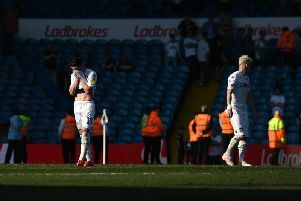 Leeds United defender Liam Cooper is to retain the captain’s armband following the departure of Stephen Warnock to Derby County. Cooper will lead United for the third game running tomorrow and is in line to captain the club through the rest of the Championship season in the wake of Warnock’s sudden exit. Warnock’s move out of Elland Road has seen the armband change hands for the third time in six months. Centre-back Jason Pearce was named as skipper by former head coach David Hockaday in August but Warnock replaced the 27-year-old after Pearce lost his place in United’s starting side at the end of November. Cooper, who is 23 and joined Leeds in a £600,000 move from Chesterfield in the summer, assumed the armband for United’s FA Cup defeat at Sunderland a fortnight ago, with Warnock suffering from an ankle injury. Leeds said Derby had signed Warnock in an “undisclosed deal” but the club are not thought to have received a fee for the left-back. The money involved is understood to have been used to pay up the remaining six months on the Warnock’s contract.